New Orleans We used to kid a long time and excellent organizer who worked for our sister union, Local 880. In an early session as a newly hired organizer being handed a standard training document extracted from remarks that Cesar Chavez had made about the importance of the dues system in building the farmworkers’ union, he had innocently asked, “Who was Cesar Chavez?” The story was both shocking and unsettling. On one hand those of us only a decade or so older wondered, how could anyone not know something about the legendary Chavez, the grape boycott, and the struggle to organize the California fields? On the other hand, it hit us all like bricks how quickly working peoples’ history is smothered in silence. The State of California has declared a Cesar Chavez Day, and that’s well and good, but it’s Mike Garcia who is on my mind. Mike passed away this week. He was a great labor leader and an excellent organizer. He was a comrade and friend. His song should be sung. His work and memory needs to be raised to the sun, because his shadow will be long. I first Mike in the late 1980s in the mountains outside of Denver. He had come over to Colorado from California as a trustee and then president of SEIU Local 105 to try and build a presence and power for janitors in Denver and Kaiser healthcare workers. Jon Barton, who had worked for several years as an organizer with Local 100 until his homesickness for California had pulled him back west, was Mike’s lead organizer, and they had invited me out to a staff retreat, training, strategy, and planning session for the local somewhere near Evergreen. As Jon had suspected, Mike and I were kindred spirits and hit it off, beginning a permanent friendship and alliance both within the SEIU and with ACORN. Until he was forced to retire several years ago to deal with health issues, Mike ended up leading a 40,000 member amalgamated service workers’ union of janitors, security workers, landscapers, and other lower waged workers built out of sweat, struggle and steel over decades. Before Jon had come to Louisiana, he had done a stint with a small, craft union trying its hand at organizing Silicon Valley, and it was exciting to be in regular touch with him and Mike when they reunited in California to systematically, and largely successfully, organized janitors in major companies in the Valley. I still can’t read about Apple and other mega-rich tech companies talking about their generous employee benefit programs without remembering how hard – and corruptly – they fought against fair pay and decent standards for their janitorial and service subcontractors. 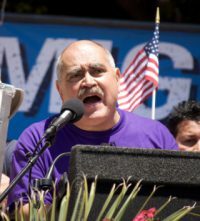 These campaigns made Mike’s reputation as an organizer and his leadership of Justice for Janitors with his organizing team around the state including the decisive strike in Los Angeles at the turn of the century marked his stature as a unique, unbending labor leader in California. For years Los Angeles was part of my regular route, and there weren’t many times that I didn’t reach out for Mike to catch up, if our schedules intersected, or spend time with him when we were on the board of SEIU together, catch as, catch can. I had heard his health was getting worse. I wish I had seen him in recent years. For a last laugh. For old times’ sake. For his advice and counsel. And, just to thank him for his friendship and his life’s work that allowed all of us to stand strong with him and be steadfast to the cause. For organizers and leaders like Mike, there won’t be any special day, but every day was special in solidarity and struggle. This entry was posted in Labor Organizing and tagged Mike Garcia, SEIU by Wade. Bookmark the permalink.